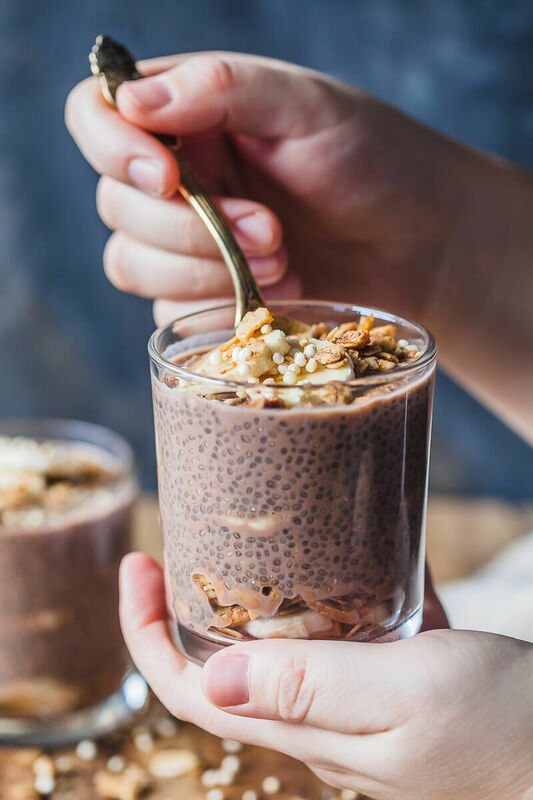 Place chia seeds, almond milk and chocolate syrup into an air-tight container, stir well to combine and refrigerate overnight. In the morning, peel and slice a banana and place a couple of slices on the bottom of a bowl or glass. Add a sprinkle of granola and top with a couple spoons of chocolate chia pudding. For the granola we used homemade gingerbread hazelnut granola. Repeat with a layer or banana slices, a layer of granola and a layer of chia pudding. Finish with a couple almond slices and top with a sprinkle of quinoa puffs.